This is a major league side dish in many South Louisiana restaurants. 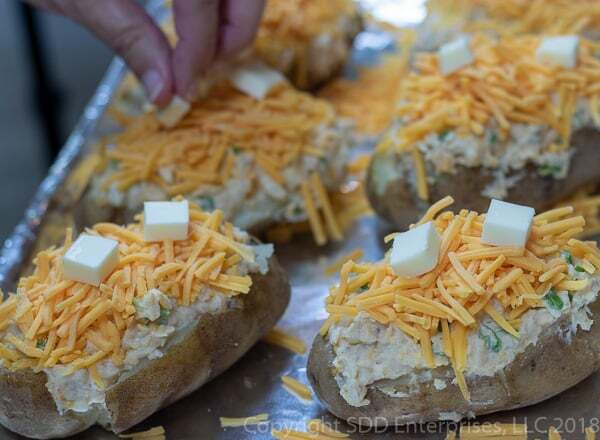 Sometimes called Stuffed Potatoes and sometimes called Cajun Potatoes, but everyone knows Twice Baked Potatoes. 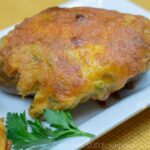 They are just what they sound like, bake a potato, scoop it out, make it creamy and cheesy and mix with lots of Cajun flavors then stuff it back into the hollowed out potato shell. Top it with more cheese and bake it to a bubbly, cheesy, flavorful partner for your steak, seafood or just about anything else. It’s actually pretty simple if you follow Sweet Daddy D’s no-angst recipe for Cajun Twice Baked Potatoes. Sign up for my email notifications of new recipes and posts right HERE. 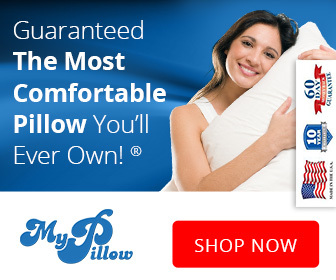 This post is not sponsored, but you will find affiliate links on this page. As an Amazon Associate, I earn from qualifying purchases. The price you pay as a consumer does not change, but I may make a small commission based on your purchase. Baking potatoes-russets are the best, creamed up with whole milk, sour cream and lots of butter. 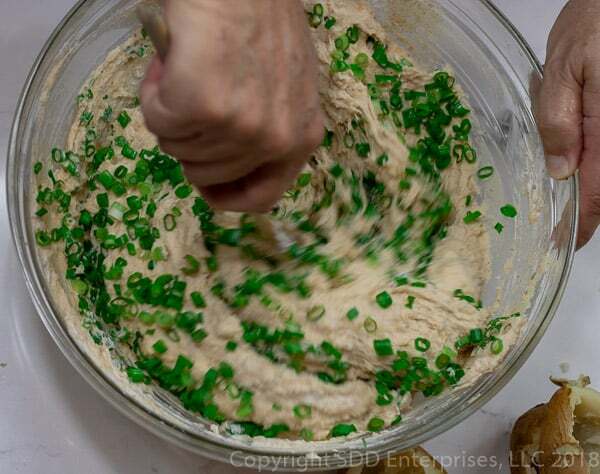 The wonderful Cajun flavor comes from green onions, some Creole Seasoning, garlic powder, white pepper and kosher salt. We’ll use a boatload of sharp cheddar cheese to mix in with the mashed potatoes and to heap on top. I find it better to get a block of cheese and grate it fresh but you can save some time by buying cheddar cheese already grated. This is like making some loaded mashed potatoes and stuffing it all back into the hollowed out potatoes before baking it twice-times, really adds to the overall flavor. First…you have a beer. This is such a fun and delicious thing to eat, so start with the fun right away. Pop a top and read the recipe all the way through and make sure you have everything you need. That’s what the mise en place does for you: no surprises, no angst! Decide how many servings you want. This recipe calls for six potatoes to which we will slice off the top and restuff. That yields six pretty big servings (of course you can always cut one of these big girls in half). You could slice the potatoes in half lengthwise which would give you twelve potatoes of a smaller size. Gauge how many potatoes to prep to fit your needs-each potato will yield either one or two servings depending on the size you want. 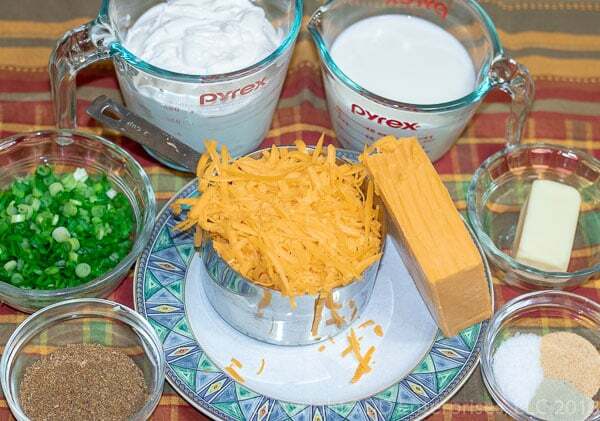 Make sure you have all of the other ingredients-measure the milk, sour cream, butter and spices then grate the cheddar cheese and slice the green onions while the potatoes are in the oven the first time. then wrap each one in aluminum foil before placing them in a 400-degree oven. It should take about 45 minutes to an hour until the potatoes feel like they are softening. Test them by applying a soft squeeze with your hand using a kitchen towel as a pot holder. 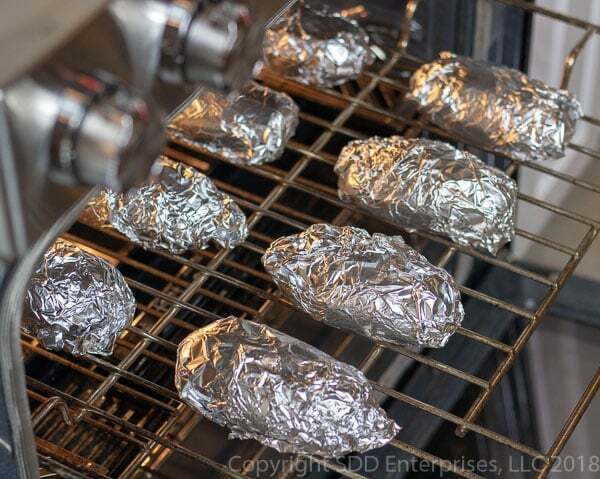 Once they are ready, remove the potatoes from the oven and carefully remove the aluminum foil. Let the potatoes cool off quite a bit before you handle them. We want to end up with a hollowed out potato shell so that we can re-stuff it. When the potatoes are cool enough to handle, slice the top off lengthwise and use a spoon to scoop it out, leaving no more than a quarter-inch of the shell. If you poke a hole or rip the skin, it’s not the end of the world. 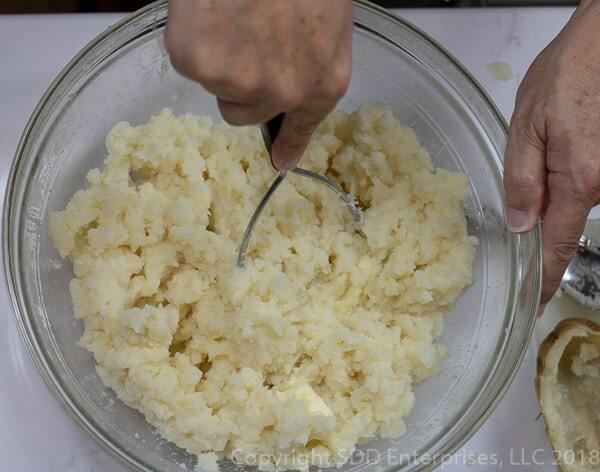 Place all the scooped out potato in a bowl and smash it with a potato masher or a fork. mash with a potato masher or a hand mixer. You don’t want it to be too wet at this point because you still have to add the sour cream, and you do want some lumps. 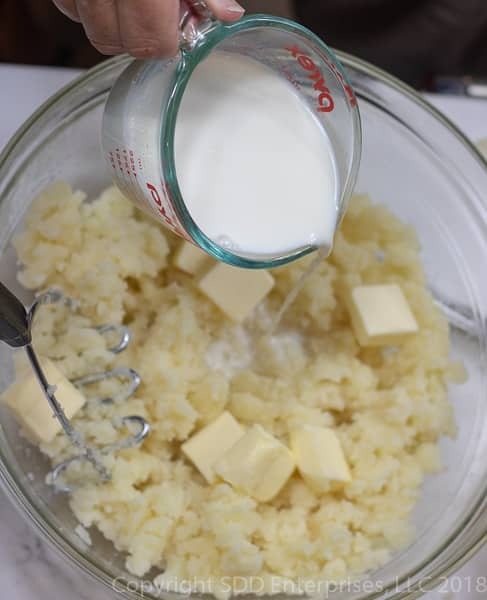 Add enough milk to give you a stiff, lumpy mashed-potato consistency. Next, add the Creole seasoning and about half the sour cream and mix that together well. Mix in some more sour cream until it’s pretty loose. and about ⅔ of the cheddar cheese. Mix all of this together with a stiff spatula until it’s thoroughly blended into creamy but thick mashed potatoes. 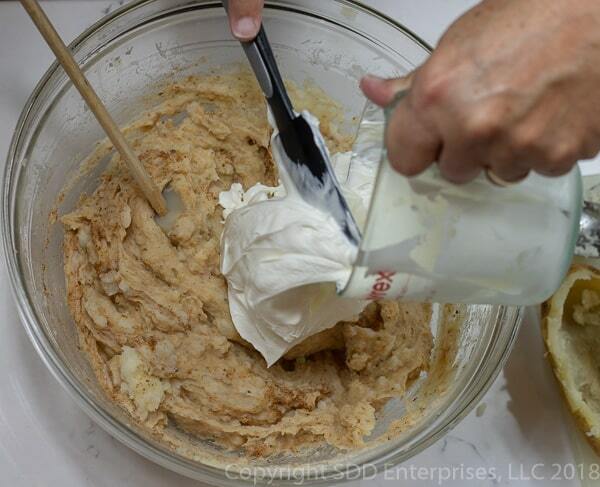 Use the spatula or spoon to stuff the potato mixture back into the shells until they are slightly overfilled. Press down on the stuffing to make sure all the voids are filled with deliciousness. 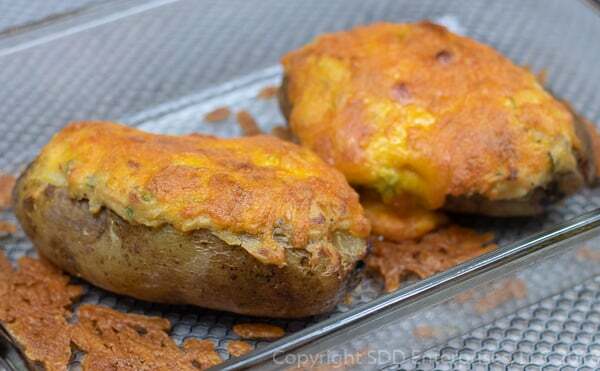 Top each potato with a heaping layer of grated cheddar cheese and two small tabs of butter, then place them in an ovenproof baking dish or sheet which has been rubbed with a thin layer of oil or butter. Now place the baking dish in a preheated 350-degree oven until the top is bubbly and slightly browned. This should take about 30 minutes. The Twice Baked Potatoes will be gooey and overflowing just a little and look absolutely delicious…and they are. Take them out of the oven and let them cool slightly so no one gets a burned tongue! That’s it, all there is to it. Baking the potatoes in the oven is best if you plan to stuff them because the potato is cooked more consistently which makes it easier to scoop out. Poke holes then wrap in aluminum foil before baking. This helps to steam them slightly which will make them creamier. 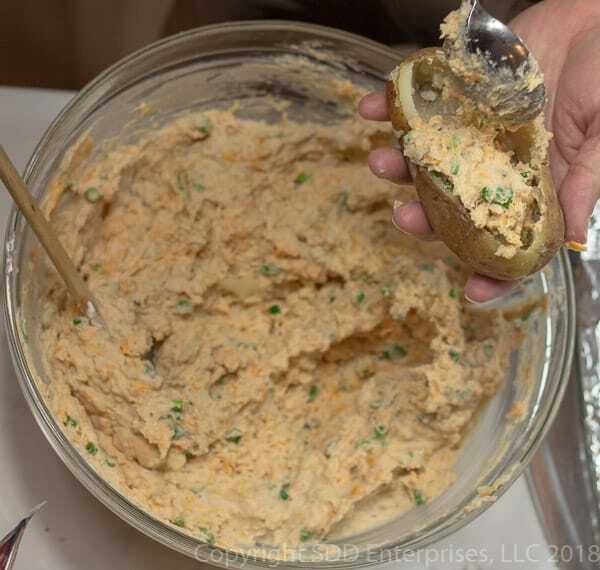 This can be made into a casserole or stuffed into those small aluminum tins that are about the size of potatoes. If you go that route, using the microwave to soften the potatoes is fine. If you have leftover stuffing after filling all your potatoes, just put the rest in a casserole dish and freeze it. Sealed properly, it will last a couple of months. To finish it, just thaw it out in the fridge, then bake, uncovered, at 350 degrees for about 30 minutes. If you have a favorite method for baking potatoes, do it the way you always do it. It’s just a baked potato. You can slice the top off of the potato or you can slice it in half lengthwise. 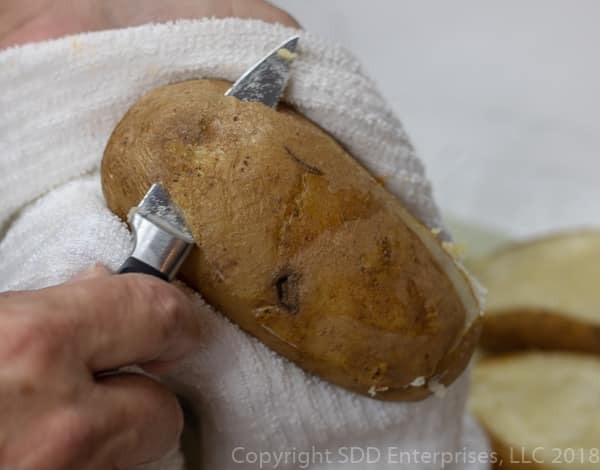 Slicing the top off will give you one large stuffed potato, slicing it in half will give you two smaller stuffed potatoes. Adjust the quantity of the ingredients to match how many potatoes you use. Add the milk, sour cream, green onions and cheese a little at a time. The quantity you will use of each will depend on the quantity of potato you end up with and your personal preference. Grating the cheese yourself right before using provides the best results. While the pre-grated cheese works well in this recipe also, sometimes it can be a little dried out. Make sure to look for fresh looking grated cheese if you go that route. If the cheese isn’t browning after about 30 minutes in the oven, turn the broiler on for a couple of minutes until the cheese begins to brown. Don’t walk away, though, because the broiler can work pretty fast. These potatoes can be frozen before or after the second baking. Make sure they are completely cooled, then wrap them tightly in plastic wrap and place them in an airtight container. They can be stored in the freezer for a couple of months. To reheat already twice baked potatoes, thaw them out and place in a 350-degree oven for about 15 to 20 minutes, loosely covered with aluminum foil. If not twice baked already, thaw, then bake about 30 minutes, uncovered. These are a treat-eat everything including the skin. That’s where the nutrients and fiber are! If you make this recipe, please tell us about it in the Comments section below and make sure to LEAVE A RATING ON THE RECIPE. Post a picture on our Facebook page or on Instagram with a #firstyouhaveabeer. Make sure to Pin it on Pinterest. Follow us on Facebook, Instagram and Pinterest and make sure to share this with your friends…they will love you for it. SIGN UP FOR OUR EMAIL UPDATES below so you don’t miss anything! This cheesy, creamy Cajun staple is the ultimate side to go along with steak, fish, seafood platter...just about anything! Once you try Cajun Twice Baked Potatoes, its the only way you'll want to eat a baked potato...don't say I didn't warn you! Remove from the oven and allow the potatoes to cool. 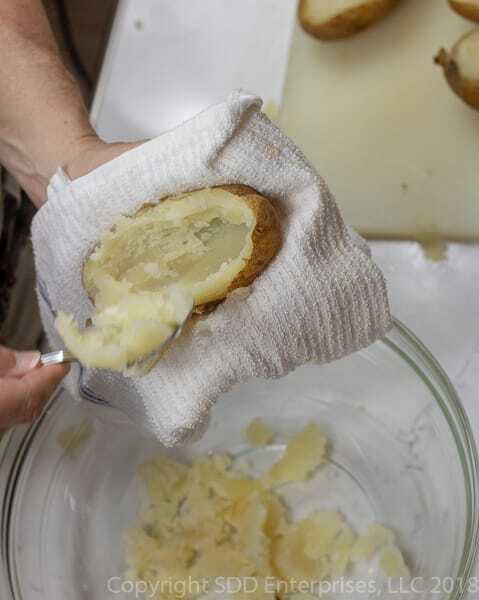 Slice the tops off the potatoes lengthwise and scoop out the potato, leaving a bowl or boat. See Notes. Place all the scooped-out potato in a bowl. Using a potato masher, smash the potatoes. 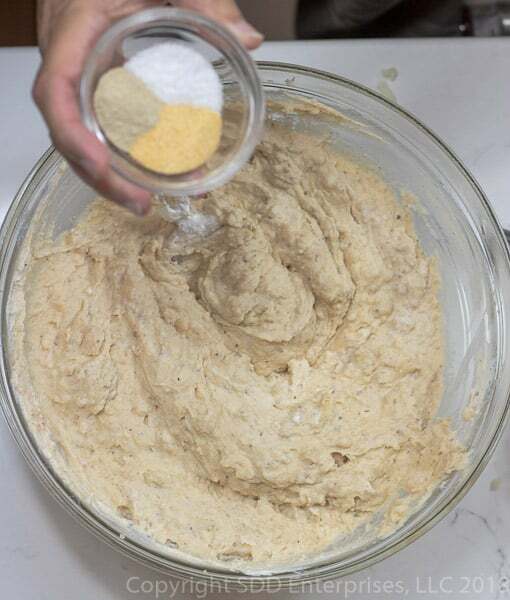 Add cayenne pepper (if using), kosher salt, white pepper and garlic powder, green onions and cheese and mix well until thoroughly blended. 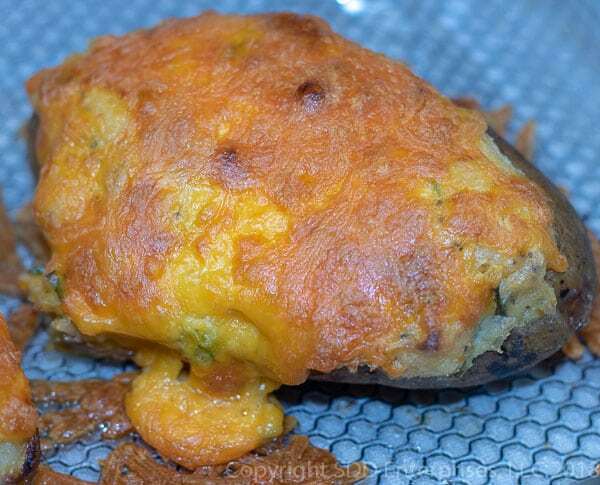 Spoon the mixture back into hollowed out potato shells and cover with cheese. Place a couple of small tabs of butter on top of each potato. Place in an oven proof baking dish and bake at 350 degrees for about 30 minutes or until the cheese begins to brown. Preparing the potatoes in the oven will prepare the potato better for scooping out than using the microwave. If you decide to make a casserole or use the aluminum tins, the microwave is fine to use. 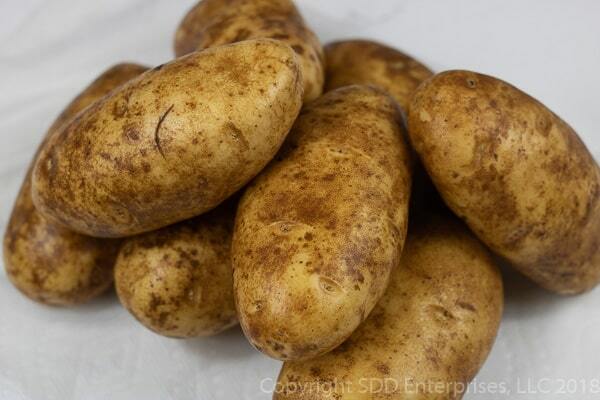 To bake the potatoes, wash each potato under running cold water and brush gently with a soft brush. 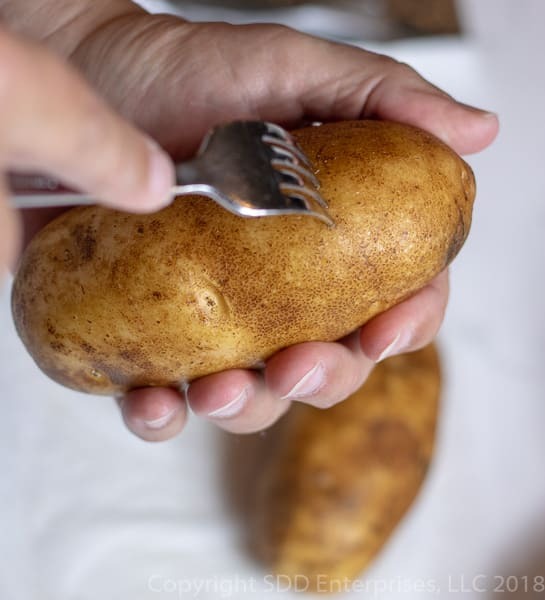 Poke about 6 holes into the potato using a fork, them wrap each potato in aluminum foil. 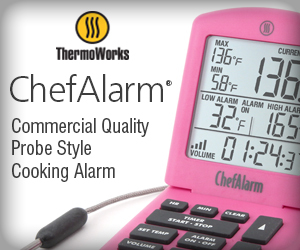 Bake in a preheated 400-degree oven until you the potato is softened. You can slice the top off of the potato or you can slice it in half lengthwise. Slicing the top off will give you one large stuffed potato, slicing it in half will give you two smaller stuffed potatoes. 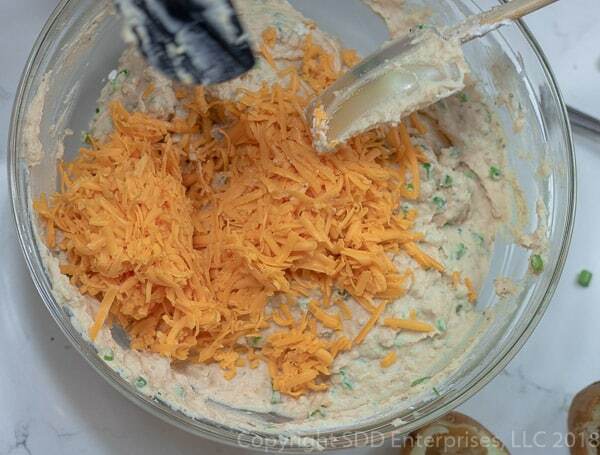 Add the milk, sour cream, green onions and cheese a little at a time. The quantity you will use of each will depend on the quantity of smashed potato you end up with and your personal preference. Grating the cheese yourself provides the best results, but pre-grated cheese works well also. This can be made into a casserole or stuffed into the small aluminum tins if you don’t want to stuff the potatoes.